With the increasing popularity of the Internet, many more people are purchasing devices which can benefit from being connected to the Internet. It is very rare that all these devices will be in one room and that this room will be the best location for you to place your Sky router. People are demanding that they should be able to get the best possible speed from their broadband connection and that they can access this connection anywhere in their home. With this all in mind, I have composed the attached document. I hope that you will find it useful as a way of sign posting what is possible in a reasonably clear manner. Many thanks to all those who have helped to check it through and for the useful comments. Also thank you for everyone whose comments and suggestions through the forum have been incorporated in various parts within the document. In this document I have mentioned various products. For those who have a vested interest in networking products, please note that these products have been used for illustrative purposes only. I am sure your products will be able to perform just as well, perhaps even perform better. It is also reasonable to assume that not only will prices continue to change, but that the specifications and functionality of products too will change, hopefully for the better. It is for these reasons that I have refrained from mentioning specific model numbers and prices too often in the document. If members of the forum wish to find the most recent product to help perform a specific task or want to find out how well something works, then please feel free to ask on the forum. Home networking for a non-techie can be a daunting task at the best of times. Trying to share your broadband connection at home across all your devices can be a challenging task without help or guidance. We have written a simple guide on how to set up your home network, and what options you have in terms of connecting your equipment. If you run a wireless network, it's important that you enable WPA/WPA2 encryption so we've included advise on this, so that you can have peace of mind that no one is eavesdropping when sharing content over your wireless network. Check out the home networking guide, and happy networking! I did notice a small error though. It talks about the theoretical maximum speed for WiFi n being limited to 150mbps. Sky's Sagem 2504N supports 144mbps on a single channel. Many other routers work at up to 300mbps. There are some routers which will run at up to 450mbps. They should have made it a bit clearer that the maximum rate of wireless N is 150mbps on a single channel. When both the router and adapter a capable of channel bonding, the rate rises substantially. Using WiFi n on a single channel, the limit is 144mb/s. As for HomePlugs, it does depend on the quality of your wiring. I recall someone posting about how a previous owner have added spur-sockets and that they gave a terrible performance, when compared to using other sockets. 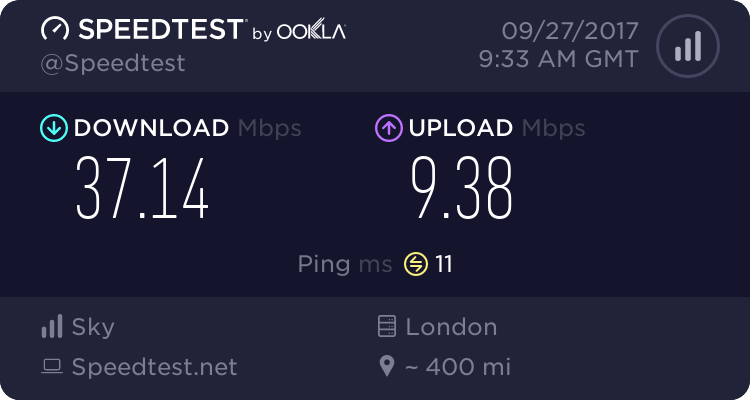 I haven't got any to test with anymore (gave them to others who needed them) but I don't recall the PowerLine adapters I used giving me a throughput as low as 40mbps. I'm pretty sure they gave me a figure closer to 80mbps. Internet speed depends upon your Internet connection and your modem/ Wifi router. So what are the other ways to increase to the download speed? There are many things which can improve your connection. Perhaps if you were a resident of the UK we could help you. Since you seem to be posting from multiple countries, I can only assume that you are a little lost. I am going to get a power line solution for my gaming room my PC ps3/ps4 lol and home cinema and TV some will be wifi and the rest power line. my mother has one where it has 3 ethernets off one block so I'll choose the important ones for that.